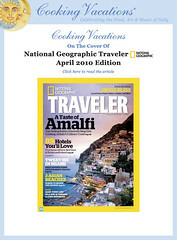 Congratulations to Cooking Vacations on their fabulous cover story on the Amalfi coast, by Elizabeth Berg, in the new issue of National Geographic Traveler. It was Cooking Vacations that arranged for my complimentary cooking lesson when I visited Italy with my nephew in 2006, which I wrote up for the Packet. Just that one splendid evening at a wine estate in the hills outside Florence convinced me that these are the go-to people for Italian culinary vacations. They have relatonships with properties all over Italy, the scope of what they offer is broad and inspiring – even armchair travelers will be sorely tempted after browsing their website. Hard to resist when they take care of everything! “After the Church celebration, everyone celebrated with pranza at La Taverna del Leone, where Chefs Philomena and Fortunata prepared an endless 9 course lunch. A Prosecco toast started off the festivity, followed by Mozzarella & cherry tomatoes on a skewer, delicate polenta squares baked with sugo, delicately fried alici & biancetti with lightly tossed with sea salt and served in paper cones-and that was just the aperitivo! “First course included zucchini & melanzana stuffed with an olive, cheese, and bread, small size focaccio, zucchini flower bites, and more. Second course included hand-made ravioli Caprese – stuffed with organic Ricotta and basil. Third course Risotto pescatore. Fourth course, fresh caught Pezzonga, a delicate local white fish served with Julian-style vegetables. Fifth course, filetto grilled and served in a slow cooked Aglianico wine with a piping of potatoes. Sixth course semi-freddo and miniature cannoli.